Master Segments generate a workflow that unifies Master Table, Attribute Tables, and Behavior Tables. Because workflow tends to be a computationally heavy process, Arm Treasure Data provides a way to avoid the compute resource conflicts with other jobs and processes you’re currently running. Your selection determines which processing engine is used for the master segment creation. 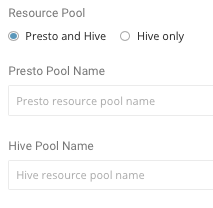 You can also specify which resource pools to use for each engine. Specifying resource pools gives you additional compute resource control.